New Year's Eve in Germany is called Silvester. The last day of the year is the saint's day of pope Silvester, who died 31 December 335. 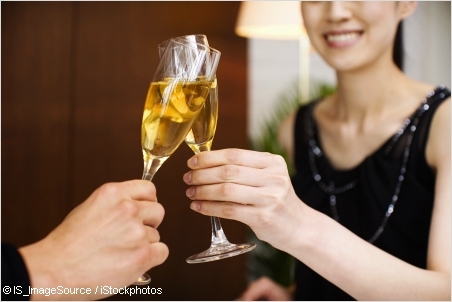 New Year's Eve traditions often include old superstition, which has been passed on for centuries. 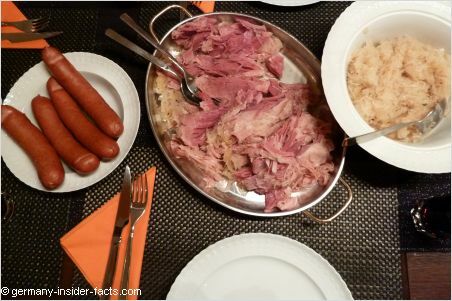 But customs & what is considered typical Silvester food vary throughout the country. Read on & enjoy my random collection of New Year's Eve traditions in Germany. You will also learn some common expressions we use at the turn of the year. I admit, the above picture is a composition. Fireworks to welcome the new year are very popular, indeed we Germans spend a lot of money on private pyrotechnics. 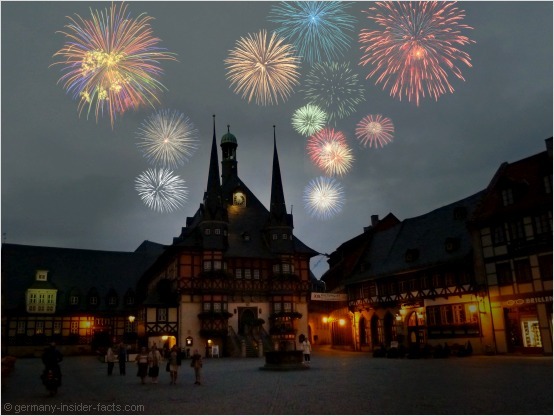 However, lighting firecrackers close to the historic half-timbered houses is prohibited by law, so they are banned in many old towns. Many cities & towns have their official fireworks that are safe & under control, the biggest is certainly the one in Berlin. This is a result of the old pre-medieval belief to ward off evil spirits with a lot of noise. Now these days, the displays of fireworks are just for joy. Amongst all the noise of the fire-crackers you'll also hear the sound of church bells ringing around midnight. Fireworks for private use are only available to buy from December 27. It is allowed to burn them off on Silvester & New Year's Day. We Germans have a lot of choice how to spend the night and greet the new year. There are public parties with local music bands, Silvester dinners at restaurants, and parties amongst family & friends. Shortly before midnight we open a bottle of sparkling wine (Sekt), or champagne. Then we count down the last seconds of the old year... 10, 9, 8, 7, 6, 5, 4, 3, 2, 1... Prost Neujahr! Hugs, kisses & good wishes are exchanged, along with resolutions about personal changes in the new year, for example "I stop smoking", "I start a healthy life" and many others. There are some do's and don'ts for that special day. This list is by far NOT complete, it mostly reflects the customs I grew up with in Hessen. Other regions might have different traditions. Don't have washing on the clothesline! This is an ancient superstition. It should prevent that Odin (Wotan), the chief god in North Germanic tradition, gets caught in the clotheslines when he wanders around at night. My mum used to say "when you have washing on the line, someone in the family passes away in the new year". You can be sure I follow that rule! 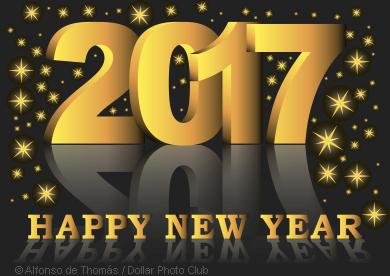 For a wealthy New Year eat Sauerkraut, or Lentilsoup and you won't run out of money in the new year. The lentils represent pennies, but I don't know why Sauerkraut. However, eating the latter is a must in Hessen. Another traditional meal is carp, and you carry a scale of the carp in your purse. Bleigießen literally translated lead-pouring is another old custom. 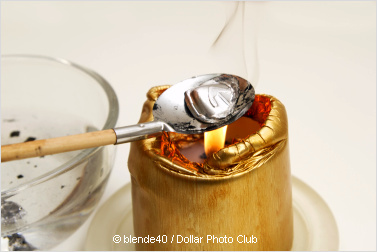 You melt small pieces of lead in a spoon over a candle, pour the liquid lead into a bowl with cold water. The resulting shapes are fairly bizarre. Use your imagination to determine what the figures look like. A fun way of fortune-telling. Of course you won't hear the expression Happy New Year in Germany. Instead we say "Guten Rutsch" on Silvester Day to wish everyone a good slide into the new year. During the first day(s) of the new year we say "Prost Neujahr" as a general greeting, although this is very informal. In a more formal way you would say "Frohes Neues Jahr".
" 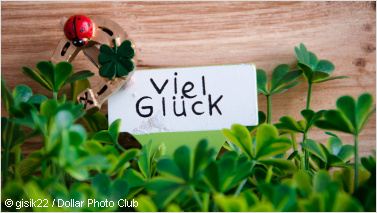 Viel Glück" means good luck, and of course this is what we wish our loved ones. It is common to give a pot of four-leaved clover, decorated with a sweep, horseshoe and/or ladybirds as a gift when you visit friends. They all are considered lucky charms. Another symbol of good luck is a small pig, made of marzipan.